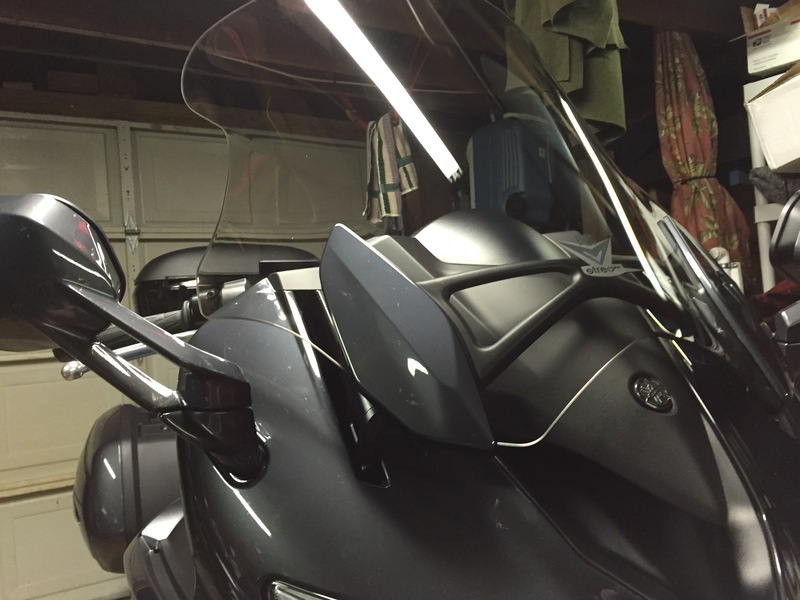 At the end of July 2015, a new horse entered the stable; a 2015 FJR1300ES. 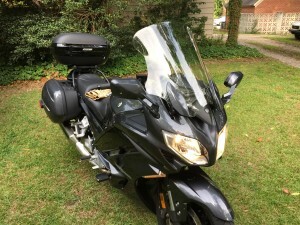 I purchased it at the Capital Powersports in Wake Forest, NC…I only mention them because they treated me right and seem to love their bikes, so kudos for a dealership that does it right! I’ve already installed a boat load of farkles and I plan to list them, as well as my experience with them, on this page…much like I did with my ’07. 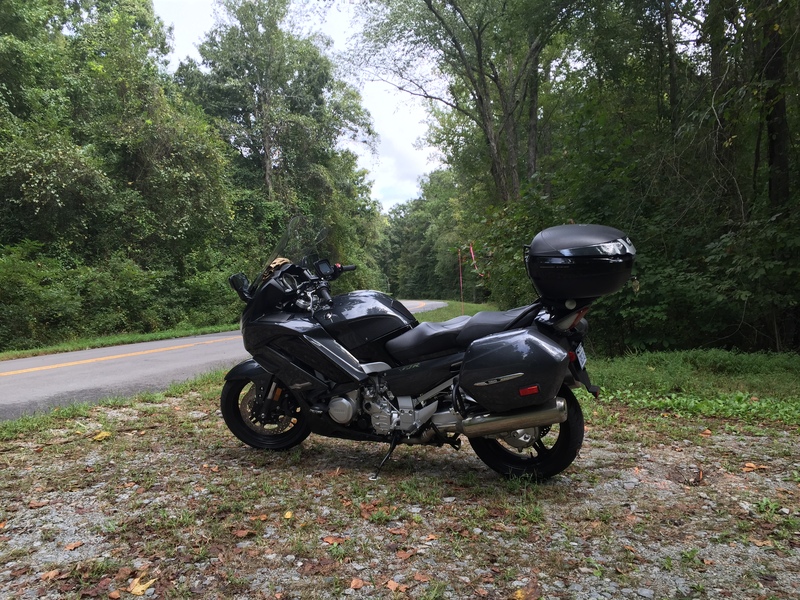 At the time of writing this, I still have my ’07 FJR, but I plan to sell it soon. I acquired the V-Stream through Revzilla. The “Sport Touring” designation refers to V-Stream’s medium sized windscreen; they also offer shorter and taller versions. The windscreen has a light gray shade to it and it goes perfectly with the 13’s understated blacks and grays. I used a V-Stream with my ’07 also; however, it was a bit bigger. After having run with this screen on the ’15 for awhile, I like it! The airflow over the screen hits my helmet right at the top of my helmet’s visor in the low position; raising the screen brings up a pretty quiet pocket of air. The V-Stream will absolutely not work for the summers here in the southeast as it simply blocks too much air, but it’s ideal for the cooler weather of spring, fall, and winter. The V-Stream really adds to the look of the bike, plus it barely flutters…something I couldn’t say about my ’07’s V-Stream. So, for the hot months, I’ll run the OEM screen (it’s a vast improvement over the Gen II OEM screen in my opinion) and, for the cooler months, it’s the V-Stream. I’d never had a top box before and kind of thought I’d never want one; the rack I had on my ’07 had worked just fine after all. Well, just before picking up the ’15, I had the impulse to get one…how did I ever live without this beauty! First off, if you’re thinking about getting a top box for your FJR, you should first consider the strength of the FJR’s rear sub-frame; it cannot handle too much weight before snapping. The stock rack is essentially plastic and will eventually fatigue itself to failure if you put a top box on and load any sort of weight in it over a stretch of time. To combat that, you have two really good options available. One is from Garauld (sp), an FJR Forum member. 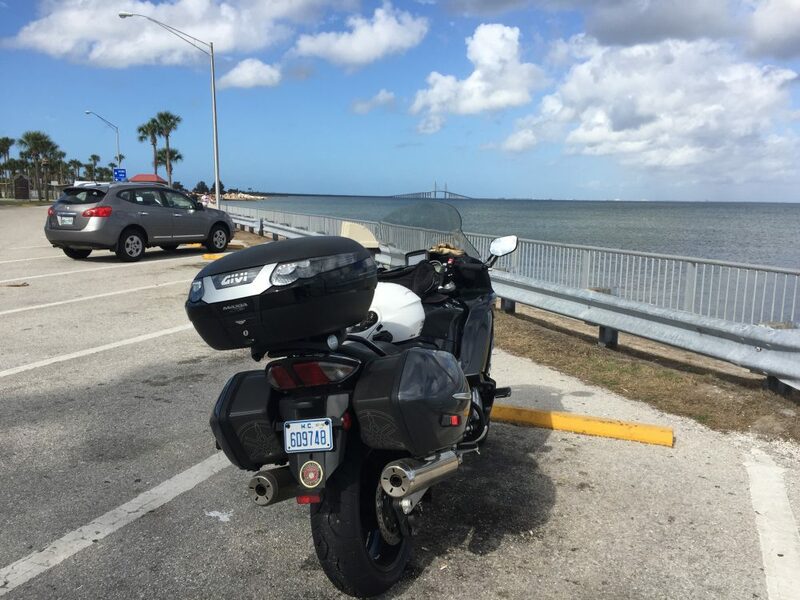 He manufactures “The Stiffy Kit”, which is essentially a backer for the stock FJR rear rack, adding some much needed support to the rear rack’s structure. The other option is the Givi SR357 rack. The SR357 replaces the stock rear rack with one made from steel; it also includes the adapter plate to fit Givi Monokey boxes. I opted for the SR357 kit from Revzilla, along with the top box. The top box is the E55 Tech version of the Maxia case. I felt the Tech version offered a look and styling more in keeping with the stealthy colors of the ’15. It’s a solid box and has proven itself to be rather sturdy when bouncing down the highway after getting hit from the rear (if it’s not already posted, there’s a ride report about that coming soon, lol). As a result of that impromptu test, I’m on my second E55 (the wrecked one works fine, but is rashed up pretty good). The only thing I’m not completely happy about is that the lid straps, which are two plastic cables, aren’t quite long enough to allow the lid to stay open on its own. Apart from that it’s a great case…and a fantastic junk drawer! I don’t load it up with too much weight, but I do put a lot of stuff in it like extra gloves, cleaning spray, towels, jacket, etc. 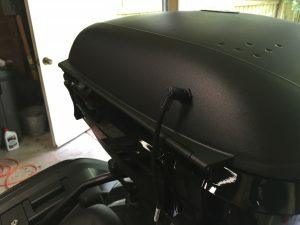 If you ride mostly two-up, it won’t be a concern, but for lone riders, the large top case might induce some high speed oscillations thanks to the turbulent air between you and the case. I’ve grown used to it as it’s not terrible; you can throw a bag in the gap to obviate the problem if it’s a concern. I might add that I close the box by squeezing from the top and bottom; I don’t like just pushing down on the lid as it seems like it puts unnecessary stress on everything. The last piece of the puzzle for the top box is the Admore Lighting E55 LED kit. Purchased from Admore directly, this light kit gives you running, turn, and brake lights. Based on a head to head comparison with Givi’s stock light setup (my friend Bob’s bike), the Admores are far and away the more reliable choice. The Givi setup relies on a contact patch on the bottom of the top box to come in contact with a power plate in the rack; it’s prone to dirt and not reliable. The Admore kit, on the other hand, uses a hardwired cable/plug. In addition to the basic kit, I also picked up Admore’s FJR specific plug ‘n play kit. The kit is designed to go between the stock plugs in the taillight wiring harness on the bike (located just behind the air intake on the bike’s left side); it’s super simple. The Admore Lighting plug. I’m not completely happy with the location. Once the plug ‘n play kit is installed, the remainder of the top box kit is wired in via an easy to use gang bar. Probably the hardest part of the installation is figuring out where to drill the hole in the top box (the kit supplies the proper drill bit); I chose their recommended location on the front facing portion of the box, but you could really put it anywhere the cables will reach. I’m not entirely happy with the final result of placement and might move it later on. The Admore lights are bright and very easy to see. The brake lights activate with a “California Flash”, flashing 5 times in quick succession before going solid; I think they are a great alternative to the Hyperlites I had installed on my ’07. Just ordered this on 9/12/2016…can’t wait! It will be replacing a LAAM custom seat that’s worked very well, but falters a bit on continuous, long days of riding.